An important aspect of room combat is the use of areas of responsibility, or individual AORs. By dividing a room into pie like sections, the room can be cleared far faster than when all operators try to cover all areas at the same time. If there are two operators in the room they each have 50% of the room. But if there are four operators theyeach only have 25% of the room. Some teams use the technique of predesignating which way each operator will move after entering a room. 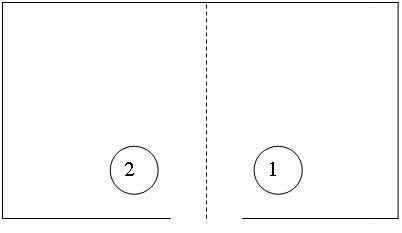 For example the first operator takes the left and the second operator the right, or vice a versa. When using a doorway as the point of entry, the path of least resistance is determined initially based on the way the door opens. If the door opens inward, the operator will plan to move away from the hinges. If the door opens outward, the operator will plan to move toward the hinged side. When entering the room, size, enemy situation, furniture, or other obstacles become factors that hinder / channel movement that influence operator ❶ 's direction of movement. The reason of using this technique is to quickly get operator ❶ in the room to clear the doorway quickly and allow the rest of the team to make a smooth entry rather than have them bogged down at the doorway. Another method is to allow operator ❶ to pick their direction based on immediate threat. The partner then takes the opposite side of the room. This can only be done once the assault has been initiated. The only time an operator will cross shoot into his partner's sector, is when a operator has cleared their side of the AOR and is needed to support the other operator. An operator may also cross shoot when his partner's primary weapon malfunctions in the face of imminent danger.